#imaginEDchat was a big success last night! I am so pleased to meet imaginative educators around the galaxy and to start to build connections. My “master plan” is to facilitate conversations about imagination that go deeper and, ultimately, to create a community where we can share resources and support each other’s imaginative work. Miss last night? Or maybe you want to review the conversation thread? 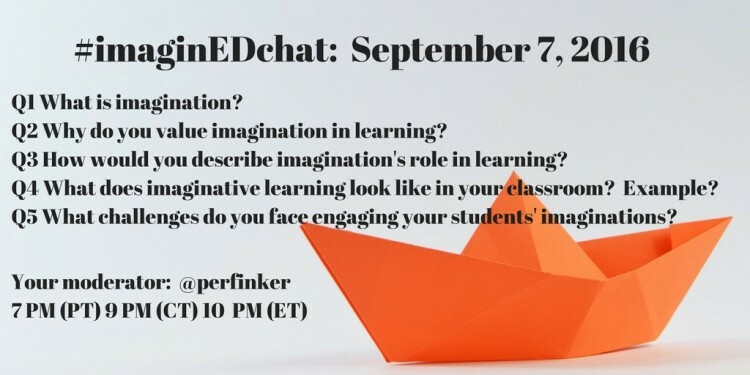 See what imaginative educators like yourself have to say about imagination’s role in education here: #imaginED chat September 7, 2016. It’s never too late to “like” or respond, retweet, or follow. As moderator I tried to welcome, connect, and share your ideas. I realize now from reading the archive that the richness far surpassed what I experienced “in the hour”. Twitter chats are warp speed. Would you be interested in a “slow chat”? One in which we address a question every few weeks and, thus, take more time to think, reflect, and go deep? Please LEAVE A COMMENT below and let me know. If you are not on Twitter and would like to participate then your first step is to get a Twitter account. Once you have an account then “follow” @imaginEDnow. 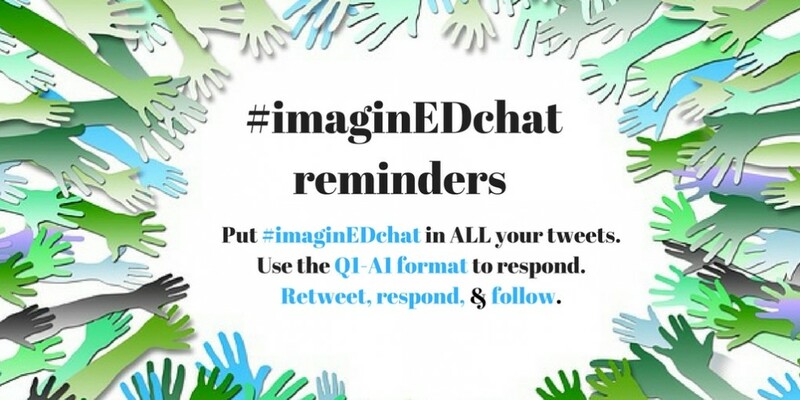 This will allow you to get reminders about #imaginEDchat, get upcoming questions, connect with others in our IE PLN, and follow/participate in the conversation. On the day/time of the #imaginEDchat, Olwen and I will tweet question(s) for discussion with the #imaginEDchat hashtag. Use the same hashtag to introduce yourself, share your ideas, and engage with other imaginative educators! Hi Susie 🙂 I love it when my ears buzz! I hope you/your colleagues find the resources at imaginED useful. More tips for teachers coming! 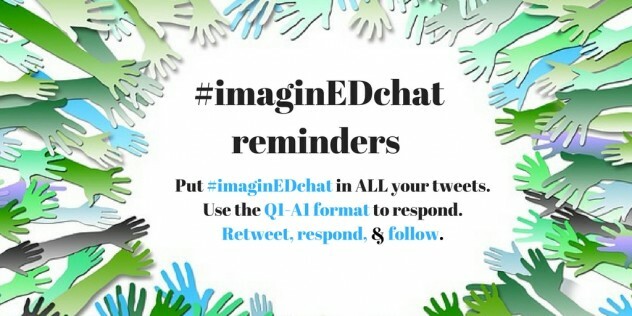 I do hope you can participate in the next #imaginEDchat…and the next one and next one. Later contributions are also great–it’s easy to reply/retweet/like from the storify thread. Next topic is story. 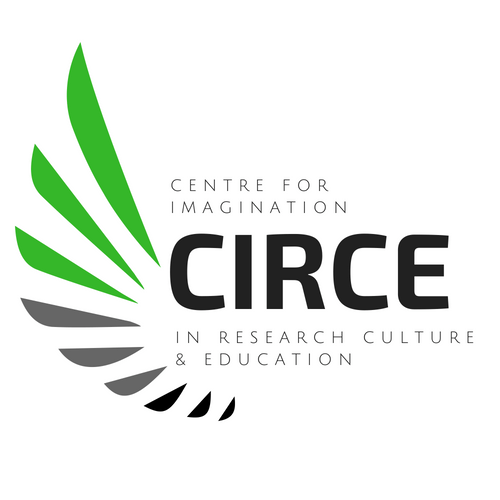 Did you see that from @imaginEDnow?